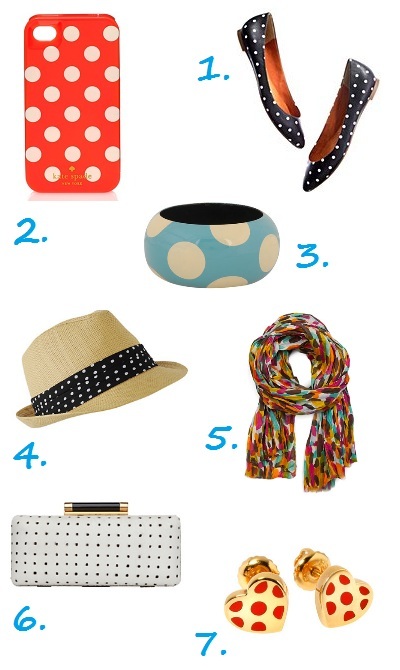 Babblings of a Mommy: Polka Dot Party. It's Monday, and I got one less hour sleep thanks to daylight savings time. If there's anything that can get me out of a my morning slump - it's a huge cup of coffee and these adorable polka dot pieces that have stolen my heart! Just looking at these playful items puts you in a better mood, don't they? Although I wouldn't suggest wearing head to toe polka dots, or mimicking Minnie Mouse's fashion sense - I would suggest you join me in the chic polka dot party. You in? I love that scarf! Adorable! I really love the flats! Those flats are what inspired this entire post. Love 'em too! Love that DVF clutch. Thanks so much for sharing on Monday Mingle at Momtrends. Obsessed with polka dots...Those flats are adorbs!